Ancient knives so sharp they could slit a hair in two, 24-carat gold extracted from cow dung and even 7,000-year-old planes that could travel to other planets. Those are just a couple of the startling claims made at this week’s Indian Science Congress. 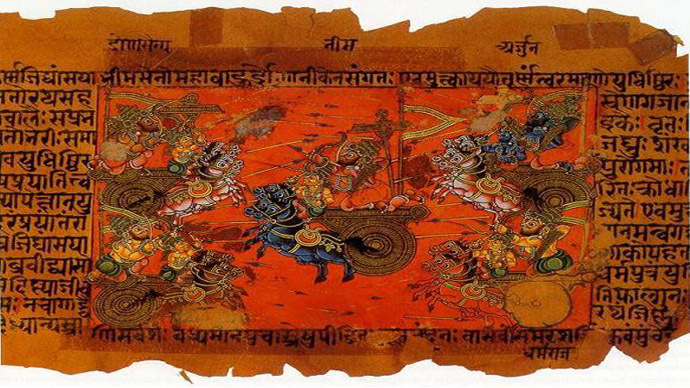 The surprising discoveries based on ancient Hindu texts, such as the Vedas and the Puranas, were presented at a session on “Ancient Indian Sciences through Sanskrit,” held for the first time in the history of the Indian Science Congress, which took place for the 102nd time in Mumbai on Sunday. One of the more controversial lectures, presented by Captain Anand Bodas, a retired principal of a pilot training facility, was dedicated to ancient airplane technology. “There is a reference to ancient aviation in the Rigveda,” Bodas said. The ancient aircraft could not only move in any direction, but travel between planets, Captain Bodas claimed. The more than 3,000-year-old manuscript also described ancient pilots’ diet and clothes. According to Bodas, during specific periods pilots drank the milk of buffalo, cow and sheep, and they wore clothes made from vegetation grown underwater. “Now we have to import aeroplane alloys. The young generation should study the alloys mentioned in his book [Vimana Samhita by Maharishi Bharadwaj] and make them here,” Bodas said. Bodas’s bodacious claims infuriated other participants in the congress, however. However, the organizers of the congress, which unites over 30,000 Indian scientists, believed they were reviving the “vast knowledge of science” contained in the Indian holy texts. Union minister for environment, Prakash Javadekar, stressed the possibility to find application of ancient Indian concepts of technology in the modern world. "Scientists of ancient India, who lacked sophisticated tools or machines, developed accurate scientific concepts based on minute observations and logic," he said, The Hindustan Times reported. Among other technologies, introduced at the congress there were polymers to build houses, made of cactus juice, egg shells and cow dung; a cow bacteria that turns anything eaten by an animal into pure gold, and the curious procedure of an autopsy, conducted by leaving a dead body floating in water for three days.